Location is an essential ‎element that helps marketers in targeting an ad campaign. No matter which area you have your ideal customers, location-based campaigns can help you reach and approach them accordingly. Be it any country, or city, geo-targeting enables you to reach the audience who can give you more business. Geo-targeting is an internet marketing tactic using which marketers tailor their location-specific campaigns. Then they feed these geo-targeted campaigns to relevant users, addressing their concerns with appropriate solutions. In Google’s term, the way of assigning a geographic location to a particular website to make searchers more relevant is Geo-targeting. By knowing the IP address location of every search conducted and by filtering the search results, locally published sites can be brought into focus. Making way for innovations, marketing techniques have come a long way where even without going to the field you can market your business anytime, anywhere just by a click. Adding on to the list is geo-targeting, an emerging tool that has risen the level of personalization in marketing campaigns. Here are the following ways leveraging which one can explore the myriads of benefits geo-targeting can offer. Personalizing messages to leave a substantial impact on customers is what you need to see a rise in email click-through rates, open rates, and often engagement rates. For making your ad campaigns even more personal than before, knowing the region or town your client belongs to gives you an upper hand in coming up with better content that shows how well you understand what your customers need. Even big companies like McDonald have made impressive use of geo-targeted ads to cater to the market demands. According to a recent study, the emails with maps had a 66.7 percent greater CTR which means that location mapping attached to your emails can help in raising click-through rates and engagement. By letting them know your physical location, you can shower customers with localized loyalty programs, discounts, and other offers. On receiving offers that cater to their demand, clients are definitely going to relish the treatment. In this way, you can show that you care for them which in turn will help your business in the long run. It is geo-targeting that allows you in tailoring location-based content and assist you in drawing customer’s attention. Without knowing who and where your target audience is, how can you plan and execute your marketing campaigns. It’s more like hitting at an unknown target, isn’t it? Having knowledge of the customer’s location is as important as knowing their needs and preferences. Moreover, if you are among marketers who are still struggling to find out where their target audiences live, then geo-targeting metrics is the tool for you. It provides you all essential and accurate details about the places where you have your brand or products in use, right from the middle of a packed city or a very sparsely populated farm-centric community, or anywhere else. There are multiple ways to engage with your customers and keep them stick to your brand. Moreover, with increased competition, the task gets more stringent, and so you need to come up with something new to survive. Offering generic discounts and vouchers are a common practice of all. You need to think differently to grab attention. 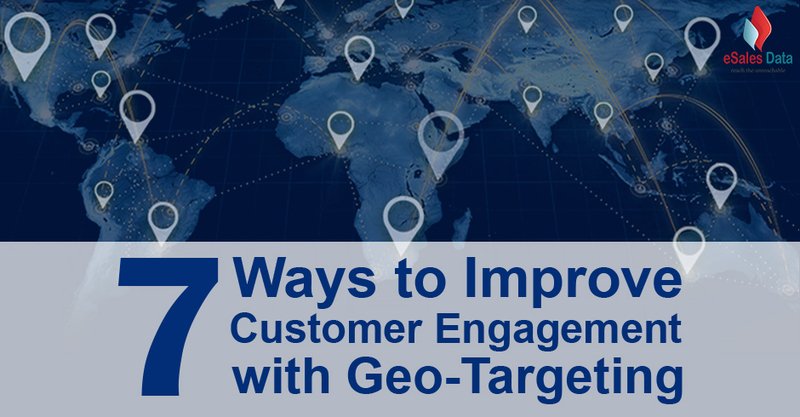 Geo-targeting can help you to plan and execute new strategies to increase customer engagement. Knowing the location of your customer can help you to send them targeted recommendations based on their requirement. Your specific recommendation meant only for particular individuals will definitely leave a favorable impression of your brand. Hence, such initiatives are really helpful in driving traffic to both online as well as for in-stores. First know your targeted audience, present market trends, and practices, and then go for planning your marketing strategy. This will help you to chuck out irrelevant methods and come up with the best idea. For knowing how to mix and match similar marketplaces, use various campaigns, and study the results, a marketer has to conduct a comparative test based on population, density, and other factors. However, apart from helping you to test and compare the new markets, geo-marketing has also proven to be a useful tool for A/B testing. Targeting customers of a specific location with relevant content is an integral part of the geo-targeting strategy. Location-based analysis can help you find and locate the right customer for business. Now, it lies entirely up to you on how you can use the advantage in your favor. For example, if you are targeting a US technology user to promote related software, then remember to have a location-specific landing page that they can relate to. As you study your market and traffic report, you get to know which location drives most of the visitors. And based on this understanding, you can develop landing pages specific to that location and its customer needs. Also, this will help you when next time a new visitor from the same area visits your website, you can direct them to a relevant landing page. With useful content that caters to customers from specific locations, you can turn around geo-targeting in your favor and drive triumphant returns from it. Customers keep coming to your brand through multiple sources. From websites, mobile apps to social media profiles, several doorways are open to them to find you. Also, the buyer’s journey and experience also vary across all the various channels. Likewise, strategic difference and dissimilarities in customer profile add up to marketers worry. That is why marketers fail in responding to every customer query. With geo-targeting, staying connected with the customer at every point of the purchase journey on any platform is possible. Businesses can easily track, recognize, and respond to client requirements in real-time. They can deliver personalized experiences to buyers using their location data which in turn helps build stronger relationships. Being right at the location where your customers want you to be, can help win trust and loyalty. Even as a B2B company owner or marketers, offering clients the convenience of location is significant in keeping them hooked to your brand. Be it business or commercial consumers; everyone wants their brand to be nearby providing region-specific products or services that are in demand. So, make the best possible use of this emerging technology as part of your expansion plan. Also, don’t forget to offer your customers a comfortable and memorable shopping experience from any corner of the world.